In January, George Couros asked this question and answered it with a definite “yes”. I totally agree with his answer and his caveat that it should be an innovative endeavor. My concern is that the urge to innovate seems to dissipate the higher people reach up the leadership ladder. There is certainly more pressure to follow the company line and as this pressure increases, the ability to innovate declines. But when you see the challenges that are facing schools and organizations, if “leaders” are not also “innovators”, there is a danger of irrelevance. As George Couros writes, the inability to think outside the conventional ‘box’ can lead torganizations like school boards to become irrelevant. This three-part series offers a whole variety of ideas and suggestions from some of the top education leaders in the United Staes on how to support innovation in schools. One suggestion from Mark Estrada, principal of Lockhart Junior High School in Lockhart, Texas is very interesting. School leaders and teachers must develop a growth mindset as Keith Heggart describes in a recent article. We are all familiar with the concept of ‘growth mindset’, and we want our students and teachers to embrace this idea. We don’t, however, insist that a growth mindset be adopted by school and district leadership. In my opinion, after working for years as an administrator in a large Ontario school board, a growth mindset amongst our leadership is sorely lacking. I would argue that what we experience in many schools and certainly at the district level is a preservation mindset. Keep everything moving, nudge forward a little, pick up the newest fad in education, but basically keep things the way they are and celebrate compliance as the gold standard. Those who do not accept this as the standard operating procedure are not welcome at the table. So, while I applaud writers like George Couros, Larry Ferlazzo, and Mark Estrada who work hard to extend the reach of new ideas on leadership, I have to ask – who is reading these articles, and who is simply paying mouth service to ideas about innovation, change, and bold leadership? 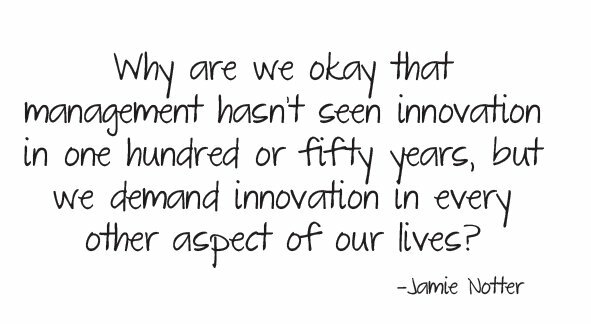 If our education leaders are not overly concerned with real innovation, do they risk becoming irrelevant? Agree very much with its message!